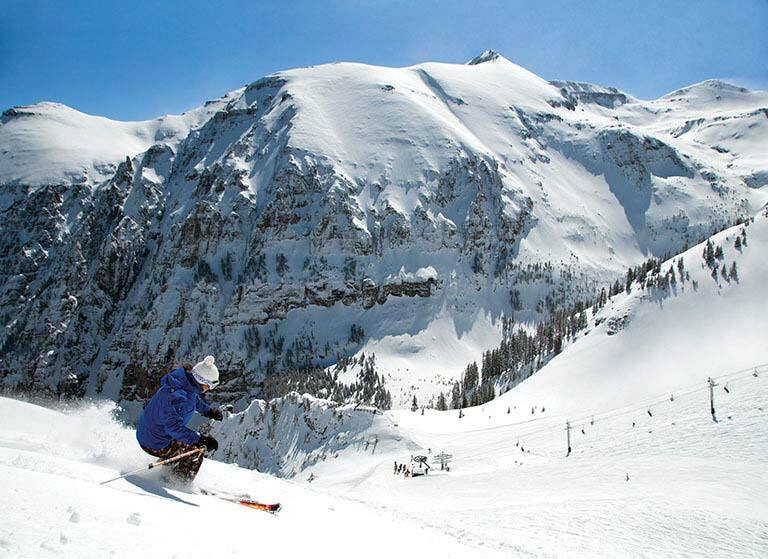 Averaging more than 300 inches of snow and 300 days of sunshine each year, odds are you’ll find fantastic conditions on Telluride’s 1700 skiable acres. And forget crowds: the trails are never packed, and there is rarely a lift line. Long time favourites include The Plunge for experts, intermediate See Forever, and the 4.6 mile Galloping Goose for beginners. Freestylers of all levels can hit one of several terrain parks. Telluride is known for its world-class skiing and snowboarding, but that's not all there is to do here. Whether you're a non-skier or you are taking a day off from the slopes there is plenty to keep you occupied in the San Juans. From snowshoeing to soaking at the spa to soaring through the sky in a glider, there's something for everyone. Telluride, Colorado is located in Southwestern Colorado in the beautiful San Juan Mountains. With direct jet service from 9 major cities across the US and world-wide connections, Telluride is easier than ever to get to. Travelers are served via Montrose Regional Airport (MTJ) and Telluride Regional Airport (TEX). Once you arrive in the mountains, there are several ways for getting from the airport to your new home away from home. Whether you plan on renting a vehicle or leaving the driving up to someone else, plenty of options are available. Linking the historic Town of Telluride and the modern Mountain Village, the gondola is the only transportation system of its kind in North America. the 13-minute gondola ride eliminates the 20-minute, 8-mile drive between both towns. Town of Telluride offers the free Galloping Goose Shuttle Service. The Goose loops around Town at 15 minute intervals. Dial-A-Ride offers free transportation for guests and residents in and around Mountain Village. In Telluride, free all-day parking is available to commuters and visitors at the Carhenge parking lot on West Pacific Street. The lot is serviced by the regular transit loop.